BFCA has donated over $70,000 to help fund research projects that are pertinent to the health and future of Bichons. Donations from owners or friends of Bichons are encouraged so this can continue. The Bichon Frise is considered a “healthy breed”, meaning no life-threatening illnesses prevail within the breed, yet it doesn’t mean there are no health issues. In the latter part of the 20th century, BFCA was one of the few breed clubs at that time to institute a survey of its members about the health of the breed. In 2007 the BFCA Health Committee surveyed the BFCA members again. You may view the results of these health surveys on this website. In addition to compiling data from the surveys, data from Ask Us health questions from this website, health incident reports, death reports, veterinary surveys, and health data from rescued Bichons is used to assess the health of the breed. Because the health data is obtained from many sources, special attention is given to certain areas of health research. With the advent of molecular biology and genetics and the mapping of the canine and human genome, researchers and breeders have begun focus on genetically-based diseases and ways to prevent and treat such diseases. This allows individual animal testing and screening of breeding lines to improve phenotype in succeeding generations. The similarity between and increasing number of recognized canine and human conditions is another important byproduct of the genome, allowing researchers to analyze and interpret DNA from individual animals with spontaneously-occurring diseases. Scientific research proves or disproves an idea (hypothesis) by using carefully prepared studies that can be replicated. Many times the process is laborious and time consuming as a method of study could be flawed or there are an excess of variables. A hypothesis proven untrue can be as valuable as those proven true. The Bichon Frise Club of America Health Committee reviews and evaluates research from various institutions that would benefit the Bichon Frise, particularly noting the ten most frequently reported diseases: 1.Skin problems/allergies, 2.Bladder stones, 3.Patellar luxation, 4.Dental disease, 5.Juvenile cataracts, 6.Cancers (most common lung, hemangiosarcoma, and liver), 7.Heart diseases (most common mitral valve disease), 8.Liver diseases (most common liver shunt), 9.Stomach problems (vomiting, gastritis, 10.Diabetes. The following is the list of research projects having been supported by the generosity of the owners and supporters of the Bichon Frise. You, too can contribute to the research of health of Bichons world wide. Just click the “Donate” button to use your credit card or paypal account. A double-blind study evaluating the effects of cannibidiol (CBD), a prominent non-psychotropic component of the Cannabis sativa plant in the treatment of canine epilepsy. Researchers will investigate genetic mutations associated with increased risk for calcium oxalate urinary stones, a painful and common health problem in dogs. 02241, 02182-A, 02176-A Intralymphatic Immunotherapy for the Treatment of Canine Atopic Dermatitis. Dr. Andrea Lam, DVM; Tufts University. 02182-A Is Defective Secretion of Antimicrobial Peptides Associated with Reduced Microbicidal Effects in Atopic Keratinocytes? This research will test 1) whether a lower amount of AMPs are secreted by allergic skin cells compared with healthy ones and, consequently, bacteria are not effectively killed and 2) if a higher amount of AMPs is retained within the allergic cells. This study has the potential to open the way for a new approach to treating skin infections that occur secondary to allergies in dog by increasing the secretion of natural antimicrobial defenses. This study will assess the absorption and plasma concentrations of acetaminophen as administered rectally by suppository in both healthy and clinically ill canine patients to determine dosing recommendations as a much-needed treatment for pain in critically ill dogs unable to take medication orally. Findings suggest that there may be an underlying genetic basis for Urinary stones. The study will evaluate the DNA from Miniature Schnauzers and seven other breeds at high risk for developing urinary stones: Yorkshire Terriers, Lhasa Apsos, Bichon Frises, Shih Tzus, Pomeranians, Maltese and Miniature Poodles, hoping to identify a chromosome area associated with the disease trait with the goal of developing a screening test for the disease. Dr. Chandler is using a laboratory animal model system to evaluate the effectiveness of a novel gel-based drug delivery polymer to release Cyclosporine at the correct dose and time needed to prevent posterior capsule opacification after canine cataract surgery. 01827: High-throughput (metagenomic) sequencing for identification of bacteria associated with canine periodontitis and oral health. After collecting plaque samples from gums of dogs with healthy mouths and plaque from dogs with advanced periodontal disease, “high throughput sequencing” will identify the types of bacteria present in each sample. This method detects the DNA of bacteria rather than live bacteria and allows bacteria to be identified and quantitated without need to grow them from clinical samples. The advantages are detecting known types of bacteria, identifying bacteria that cannot be grown in the laboratory, and finding new types of bacteria not previously discovered that may help to cause the disease. . This study evaluates if the use of PRP-collagen hydrogel treatment will enhance cruciate survival in dogs with partial CR and a stable stifle. Signal changes in the knees at time of diagnosis and how they relate to arthroscopic observations made at surgery will be compared. Dr. van de Walle and her team are focusing on a group of proteins that can change the function of other proteins and how that may affect canine mammary cells. The team successfully isolated healthy and cancerous mammary stem cells for comparative analysis and has improved ways to generate their progeny for comprehensive study. Studying how these proteins differ in healthy versus cancerous cells and tissue could lead to identification of a biomarker that is a potential chemotherapeutic target for mammary cancer in dogs. The preliminary results indicate the newly created recombinant scFv-form of the mAv 5.91 will be more effective at blocking IgE. This is a step in developing a product, similar to human Xolair, that can be used for maintenance therapy for canine allergic diseases that is safe, effective and affordable. The objective of this project is to identify proportional increases in uncleaved peptide, proBNP, relative to other peptides in the blood of dogs with heart failure. Three human markers which cross-react with canine tissue has been found. Those markers are used to identify the types of cells that become cancerous in hemangiosarcoms. One marker is studied in depth to determine the sensitivity and specificity. The final results are still being determined, but should tell how reliable this marker is in identifying the correct tissue affected. The results show that cells from stifle adipose tissue are the best to use for joint tissue regeneration. Serum vitamin B6 was measured in normal and dogs having calcium oxalate stones. Results indicate that dogs with calcium oxalate urinary stones have a vitamin B6 deficiency relative to dogs without urinary stones. Reduced serum vitamin B6 concentrations may prove to be a risk factor for development of calcium oxalate urinary stones. This study evaluates the DNA from small dogs at a high risk for developing urinary stones. Many Bichons were entered into this study. Through the genome-wide association study, three chromosomal regions associated with risk of calcium oxalate bladder stone formation were identified in miniature schnauzers. One of these regions also imparted risk in Bichon Frises.aa An exciting find was a genetic mutation within one of these regions that is strongly associated in Miniature Schnauzers. However, further research is needed to firmly establish a link between the presence of this mutation and disease development in other high-risk breeds. The research team also confirmed that dogs that form stones, specifically Miniature Schnauzers, Bichons Frises and Shih Tzus, have higher urinary calcium levels that stone-free control dogs. This suggests that a high urinary calcium level is a contributing factor to stone formation in high-risk breeds and that treatments aimed at lowering urinary calcium levels could potentially help prevent stone development. Conversely, high urine oxalate levels were not seen in these same study dogs, which suggests that treatments aimed at decreasing urinary oxalate levels may not be needed. Important candidate genes near each locus associating with PVA/MD trait. Several strategies may assist further refinement of loci involved and identification of the mutations. The results indicate that the underlying basis of Type I diabetes, while not identical in both breeds, may have some common etiology. Preliminary data indicates that Zubrin (NSAID) is very effective at blocking the production of mast cell derived eicosanoids when mast cells are exposed to standard doses of the drug. Therefore, results from these studies may provide a new strategy to modify the function of mast cells in several inflammatory disorders. Dr. Hazewinkel’s goal is to develop a DNA-screening test for patellar luxation. Identifying an inherited difference in atopic dogs may predict the risk of developing atopic dermatitis. Identifying inherited differences in atopic dogs could predict the rick of developing atopic dermatitis. Rabies Challenge Fund, Dr. W. Jean Dodds. Dr. W. Jean Dodds, world-renowned vaccine researcher and practicing veterinarian, and Kris L, Christine, a pet vaccine disclosure advocate, have established the Rabies Challenge Fund. The fund will support a 7-year and 10-year canine rabies vaccine challenge study in the US and a rabies vaccine adverse reaction reporting system. The goal is to prove that rabies vaccinations provide immunity for at least 7 years , and perhaps 10 years. 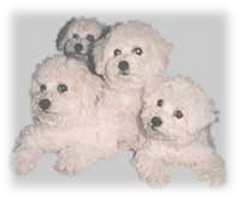 Dr. Kirk Gelatts conducted Bichon cataract research, searching for a DNA marker for inherited cataracts. A specific DNA marker was not found but some markers were eliminated. What resulted from this study was a mode of inheritance and familial lines.